Most people make a huge mistake of taking basement waterproofing lightly and leaving it in amateur hands or relying on various Do-it-Yourself guides to save money. The basement is usually in the foundation of the house or building and is always a very tempting place to do various activities because of its “underground” nature. Because it is the foundation of the entire building, it needs special attention and care right from when the house is under construction to the last day it is there. If the basement is not water resistant, it may face water flooding due to rains, mold, wood rotting and paint failures due to moisture. Excessive water flooding and wetness in the foundation for prolonged duration may even lead to collapse of the building. This is why basement waterproofing should be given in the hands of professionals who know how to handle different situations. Hiring a professional team of construction service gets you more done at a fraction of the cost of what a non-pro construction worker may provide you. How? First of all, they know the weather and the surroundings and have years of experience, which puts them in a better position to understand the needs of the building. They can give you several options, depending on cost and lifespan getting you in a position to better understand and evaluate your needs and decide accordingly. Another advantage of a pro basement waterproofing service is that you can take quotes from various services and compare the costs and options. Doing this, you will know two things; that you are not being overcharged by a company and various competitive options you can use to get better returns on your investment. They will also guide you about the pros and cons of each solution and what best suits your needs. Doing it yourself or getting a cheap amateur do the job may seem like saving money but in fact you are wasting money on the long run. You won’t be able to do everything the way pros do because of the lack of equipment and experience. Moreover, what if you tried a solution that was completely useless and was not meant for the problem you are having. So, why take the pain and responsibility when you have various experienced and professional basement waterproofing companies to choose from, almost at the same cost as what it would cost you doing yourself. You save money, time, energy and get your basement and foundations water protected while you sit and relax. Mold in a crawlspace or basement is very common. Usually caused from a variety of reasons. Most commonly mold forms in wet or damp areas. Some are caused from bad outdoor drainage that invites rain water in. In most cases high humidity levels are the source to this problem. Bad air quality and trapped moister can result to this problem as well. So what is the leading cause for mold growth? Moisture, plain and simple. Get rid of the moisture and follow the simple steps our experts have designed to increase the long life of your home and kill any and all unwanted mold. How Did My Crawl Space Become Wet? Discovering a wet crawlspace can be horrific. Lets face it, no one really goes into their crawlspace and in most cases water entering into the area can be overlooked. 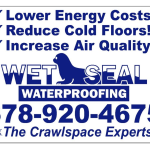 Storm water and ground water runoff are the leading cause to a wet crawlspace. If the grade level of your crawl spaces is lower than the grade level of the exterior dirt, what is stopping ground water from seeping in? This is why a waterproofing system is absolutely necessary. Exterior downspouts need to be tested, checked and extended. Outdoor drainage also plays a roll into this contributing factor. Is Mold In My Crawl Space Serious? Mold in crawl spaces can pose a serious threat, not only to the structural sustainability of your homes foundation but to your health as well. Regardless of what type of bacterial growth you have in your home, all mold is serious and should not be taken lightly. Bacterial growth lives and strives off moisture. It rots wood and weekends foundations, stains and deteriorates concrete, can be harmful and if inhaled or ingested could cause sever health disease or even death. Not to mention it smells horrific and can cause headaches, migraines and other serious allergens. Do Vented Crawl Spaces Help Prevent Mold? Vented Crawl Spaces do not help prevent mold but actually contributes to the problem. Any existing vents should be sealed up and possibly a dehumidifier be added in more serious events. In some cases it is important that all insulation be removed. This is so that any possible moisture may not be trapped in or behind the insulation. How Can I Keep My Crawlspace Dry And Mold Free? Mold can form on all types of surfaces such as wood and concrete. It can grow in rim bands, OSB and floor joists. This becomes a very serious problem if overlooked or not caught in time. In many cases if not corrected can cause saggy floors, rotting wood and cracked load bearing walls. Before it gets to this point, the proper steps we have come up with needs to be applied. All existing vapor barrier need to be disposed of, including unnecessary trash and debris. All Vents and openings need to be sealed from the inside to prevent moisture. Any water seepage needs to be diverted or a waterproofing system be installed. A mold treatment preventative needs to be applied to all exposed wood and concrete. A sealed vapor barrier known as (encapsulation) needs to be applied to all exposed dirt and any walls below grade level. Lastly we recommend a dehumidifier be installed to insure the air quality and relative humidity is at approximately 55%. What Does Encapsulating My Crawl Space Do? There are many different types of vapor barriers that can be applied to your crawl space. Any type of vapor barrier is always recommended to help lower humidity levels. The ideal type of vapor barrier is our state of the art 10-mil commercial-grade Vapor Bright. Dirt and mud crawlspaces are common in most homes and presents unique problems to homeowners. Soil inside the home can produce humidity, odors and radon gases. Damp, humid crawlspaces are a breeding ground for mold and mildew, which can spread quickly throughout a home. Dirt crawl spaces give rodents and insects an easy entrance into upper levels of a home. Structural damage to the floorboards, ceilings, walls, and carpet can be caused as a result to an open crawlspace. Our encapsulation system also known as Vapor Bright, helps reduce these problems instantly. Our Vapor Bright is a multi ply nylon weave and polymer laminate design that will prevent any odors and gasses from entering the home and affecting you and your family.